2014 Collinsville HS Varsity Football -- (L-R) Front Row: Jeslynn Crowder (manager) , Kursten Mitchell (manager), Ryce Haymaker (18), Bailey McClendon (4), Justin Collins (21), Justin Prather (14), Brett Erickson (11), Cole Hadley (9), Ben Pryor (32), Brandon Lowe (2), Austin Roberts (23), Jacob Badgwell (80), LaRon Norwood Jr (28), Dalton Burton Price (98), Jeffery Buchfink (manager), and Megan Royall (manager). Row 2: Jaden Howerton (20), Sheaffer Smith (49), Tristan Castillo (87), Colton Cates (77), Coach Mike McClure, Coach Dale Harp, Coach Adam Hass, Coach Ben Davis, Coach Damon Herald, Coach Burgess Shaw, Coach Jon Benham, Head Coach Kevin Jones, Ethan Pendegrass (34), Tyler Forrest (81), Dakota Boggs (53), and Jackson Wilson (61). Row3: Jordan Caruthers (55), Mathew Proctor (65), Marcus Reeder (88), Chase Wilkins (7), Shawn Koscheski (1), Nick Jensen (63), Connor Cross (79), Stephen Wilson (75), Tim Caputo (78), Marcus Tillman (24), Ryan Haymaker (25), Conner Kitch (71), Colin Ford (62), Blake Burd (22), Ryan LeCrone (8), Josh Arnold (43), and Cutler Cole (60). Back Row: Michael McAtee (76), Jacob Harrison (51), Dakota Tredway (52), Seth Boomer (12), Roc Robbins (44), Spencer Braswell (85), Eli Emmitt (54), Nathan Schaffner (58), Nick Moore (67), Hunter Stevenson (72), Levi Draper (10), Chandler Cole (6), Tyler Ramirez (5), Joey Krupinski (70), Justin Kothe (45), Jake Douglass (56), and Sam West (13). Missed Photo: Tyler Fanning (3), Dillon Coday (30), Raymond Smith (50), Bradley Smith (73), and Dalton Cecil (83). 2014 CHS Football Seniors -- (L-R): Stephen Wilson (75), Dakota Tredway (52), Justin Kothe (45), Hunter Stevenson (72), Michael McAtee (76), Jordan Caruthers (55), Ryan Haymaker (25), Shawn Koscheski (1), Chase Wilkins (7), Bailey McClendon (4), Dakota Boggs (53), Cutler Cole (60), Jake Douglass (56), and Ben Pryor (32). Row 2: Coach Tom Redding, Gunther Vonchiltz (1), Carson Stout (11), Holt Ganzel (14), Elijah Hendricks (61), Hayden West (33), Logan Sieminskie (7), and Cole Ishmael (2). Row 3: Coach Robert Sparks, Justin Sutton (54), Garrett Moser (22), Holden Brown (15), Ethan Bracket (21), Caleb Kiester (88), Travis Hardison (4), Nate Sinni (16), and Noah Dawson (72). Row 4: Coach Sean Tesar, Tony Connor (27), Cody Miller (42), Cody Neel (73), Dylan Dobbs (77), Colton Thetford (63), Cameron Camp (76), Spencer Oslin (53), Colin Dooling (48), and Rocky O'Rouke. Missed Photo: Matthew Blissitt (8), Caden Weathers (50),Michael Stubbs (75), Braden O'Daniel (83), Caleb Kiester (88) and Alen Tyler (trainer). 2014 CHS Football Senior Group -- (L-R) Front Row: Carlie Crutchfield, Hayden Brown, Baylee Eigenheer, Kursten Mitchell, Megan Royall, and Jeffery Buchfink. Middle Row: Cutler Cole (60), Jake Douglass (56), Justin Kothe (45), Hunter Stevenson (72), Dakota Tredway (52), Michael McAtee (76), and Jordan Caruthers (55). Top Row: Ben Pryor (32), Dakota Boggs (53), Stephen Wilson (75), Shawn Koscheski (1), Ryan Haymaker (25), Chase Wilkins (7), and Bailey McClendon (4). Check back for 8th & 7th grade football team pages. Are You Ready For Some Cardinal Football? 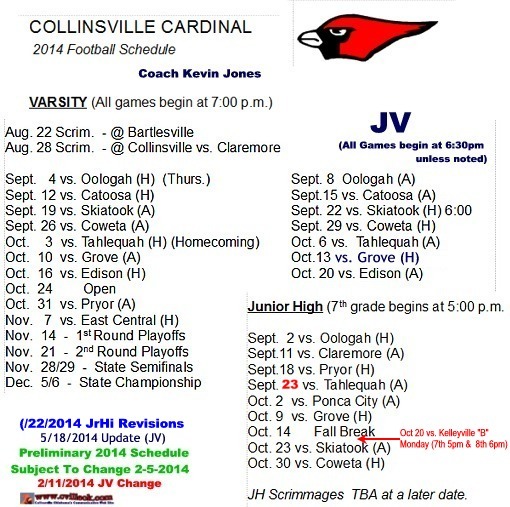 -- The Varsity Cards will scrimmage at Bartlesville Friday August 22nd, then be home for 3 weeks with a Claremore scrimmage, and regular season with Oologah and Catoosa. 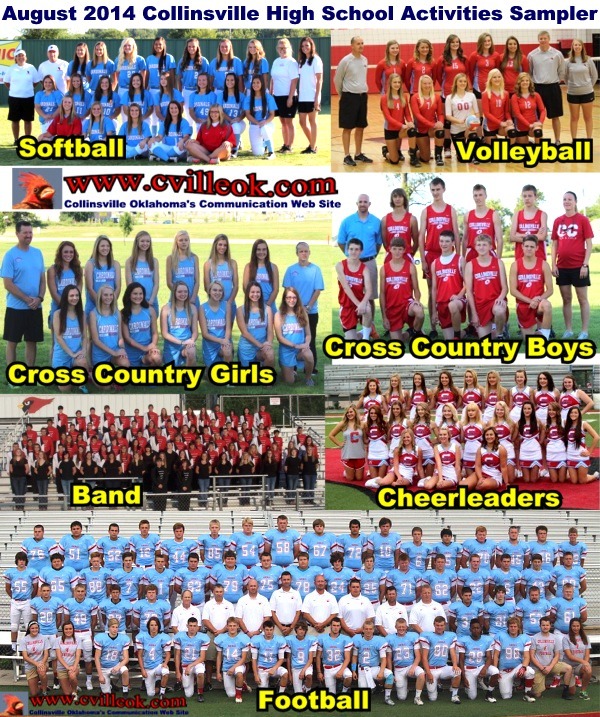 Check back for more "Meet The Cardinals" photos. -- Ted 8:30pm Thursday August 21st. -- The youth football and cheer teams will start their season this Saturday August 23rd.